BJP is trying to use the 'tea-seller' jibe hurled at Modi by his opponents to its advantage to reach out to voters. How can the Gujarat chief minister look after the nation if he cannot respect and take care of his wife, says Digvijay Singh. 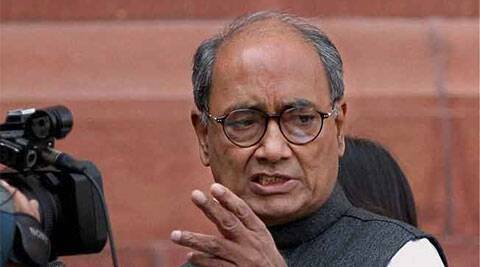 On the women’s day, Congress leader Digvijay Singh on Saturday sought to attack Narendra Modi on personal front, saying how can the Gujarat chief minister look after the nation if he cannot “respect and take care of his wife”. “I want to ask him if there is slightest respect for women in his heart, why does he leave blank the column where his wife’s name should be written in the election form. Why Gujarat’s ‘who’s who’ does not mention his wife’s name. “Why does not Modi say so if he is not married or he has left her? Poor Jashodaben (Modi’s reported wife) lives in a rented accommodation. Why does not he get a bunglow for her and provide her the facilties, when he has become such a big man. How somebody, who cannot respect and take care of his wife, will look after the nation,” Singh said. On the occasion of International Women’s Day today, the BJP’s prime ministerial candidate is holding ‘Chai Pe Charcha with NaMo’ programme through Internet at BJP headquarters where Modi will interact to people from around 1,500 different locations. BJP is trying to use the ‘tea-seller’ jibe hurled at Modi by his opponents to its advantage to reach out to voters. Singh also dismissed the threat of RSS to initiate appropriate action against Rahul Gandhi for his remarks blaming the Sangh for the assassination of Mahatma Gandhi. “Whatever he (Rahul) has said is correct. It is their (RSS’) ideology that killed Mahatma Gandhi… We will prove that Mahatma Gandhi was assassinated due to their ideology. Gandhi was killed due to their provocative statements and whisper campaign. We have been fighting this ideology and will keep fighting.